The very purpose of preaching of the Gospel is to give birth to breakthrough believers who fervently seek and are eager to carry out God’s will in their lives. The essence of nominal Christians is their passive thinking pattern. They don’t see a time frame in the Spirit, for the implementation of God’s purposes related to the vision of the Kingdom. That’s why the prophetic activity of the Spirit is passive in their lives. Also, with nominal Christians the cares of this world and fear are the dominant factors blocking their call and depriving them of their creative potential from the Spirit. These worldly cares, situations and circumstances play an active role in their lives. Church members are actively involved in the work of the church, which is related to the vision of the Kingdom. They are looking for answers and finding solutions for the fulfilment of God’s purposes. For them, time frame of the Spirit is a key factor that serves as a stimulus and acceleration of the process of implementation of God’s purposes. They are actively involved in the planned by the Church strategies and are a great help, through their call, dedication and ministry. Apostolic believers are people of the Spirit – His synergistic partner. They are not just members of the local church, but the driving force and spiritual energy that shapes the style of life, the thinking and the actions of the local church. Their dedication to the local church has only one goal – to see the complete fulfilment of God’s will, purpose and destiny over the region. Apostolic believers don’t see the church just as a place for meetings where people can be saved (this is important), but for them it is more important that the Church is a spiritual womb of conception and birth of events that expand and establish God’s kingdom on earth. For apostolic believers the Church is the Body of Christ. The whole energy and thought of the apostolic believers is focused on aggressively removing their own, and the region’s, cultural barriers and constraints that hinder Divine transformation. Their whole pattern of thinking is built around their strong desire to see lives changed and founded upon the values ​​of the Kingdom of God. They are draw their momentum, motivation and inspiration by igniting in their heart the spiritual gifts, faith and dreams for the Kingdom. 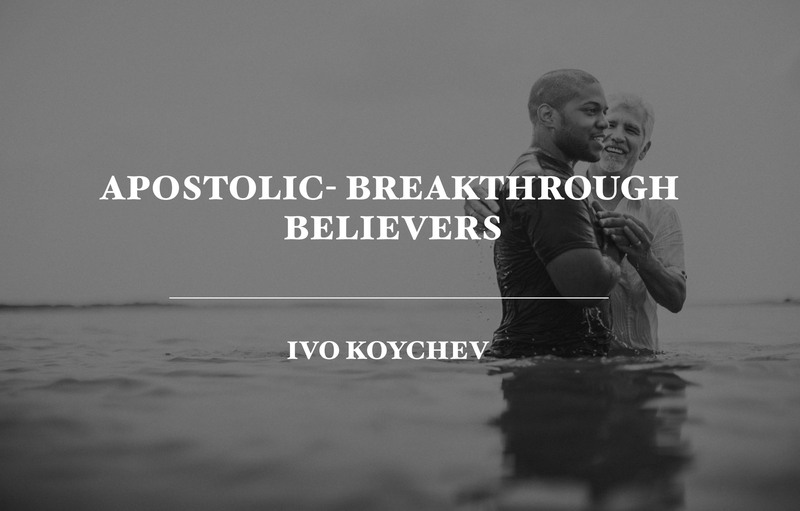 How are apostolic (breakthrough) believers born? Apostolic Fathers are those who, through the message of the Kingdom are transforming the Church into a womb. That’s here apostolic (breakthrough) believers are conceived and given birth to, in their God given destinies. 1 Corinthians 4:14 I do not write this to make you ashamed, but to admonish you as my beloved children. 1 Corinthians 4:15 For if you have ten thousand guardians in Christ, yet you do not have many fathers; because I BECAME YOUR FATHER (I GAVE BIRTH TO YOU) IN CHRIST JESUS THROUGH THE GOSPEL. In these verses apostle Paul contrasts paternity (fatherhood) and guardianship based on two main factors: guardians are trying to produce apostolic believers on the basis of principles and concepts. This can work to some extent but only within the context of religious institutionalism, which burdens the believers more with the problems of the church, than the work of the Kingdom. Scripture says that while we are under stewards (guardians) we are minors (Galatians 4:1-3). So, while believers are under this tutorial spirit, they might seem ripe for the building up of the church, but when it comes to the work of the Kingdom, they are still minors. With the apostolic fathers it’s not quite the same – they do not strive to produce, they strive to GIVE BIRTH to apostolic believers, through the gospel of the Kingdom, based on covenant relationships. It’s ORGANIC, rather than institutional, and that’s why apostle Paul says …Therefore I exhort you – be imitators of me – 1 Corinthians 4:16! The apostolic believers must have a burning desire for the Person of Jesus and His redemptive work. This will create a creative atmosphere in the spirit of their faith, that will inspire the work of their ministry. The apostolic believers must have a burning desire for their calling from Jesus, for the expansion of the Kingdom of God. The apostolic believers must have a burning desire for the salvation of souls. Christ’s compassion for the lost sinner must become the main motivator in the ministry of the apostolic believer. The apostolic believers must have a burning desire for a ministry of excellence so they can reveal the qualities and characteristics of Christ in the work they have been called. The apostolic believers must have a burning desire for a covenant connection with the apostolic fathers through responsible accountability. Also, they are to place a demand that their gifts and ministry be prophetically ignited and equipped by the apostolic fathers until they reach the fullness of their spiritual potential of faith in their calling, for the work of ministry. My prayer to God in this extremely challenging time is that He raises apostolic fathers in Bulgarian Protestantism, that will transform the church through the gospel of the Kingdom and make it a womb which conceives and gives birth to believers who are entering their apostolic destiny for the work of ministry.